Activision releases Battleship, a game set within the same parameters of the movie of the same name but not following the same story and with no Rihanna in sight. Opting to provide a first person shooter experience alongside more tactical naval based gameplay, is Battleship worth checking out, or should it be avoided as we all know that movie tie-in games are generally pretty poor. You play the game as elite specialist Cole Mathis, who, like any American soldier is pretty handy with weapons and is more akin to say Master Chief than a soldier. What this means is you’re left to your own devices following orders barked at you via the radio to shoot, maim and kill the alien invaders that are raining down on your location in the South Pacific. 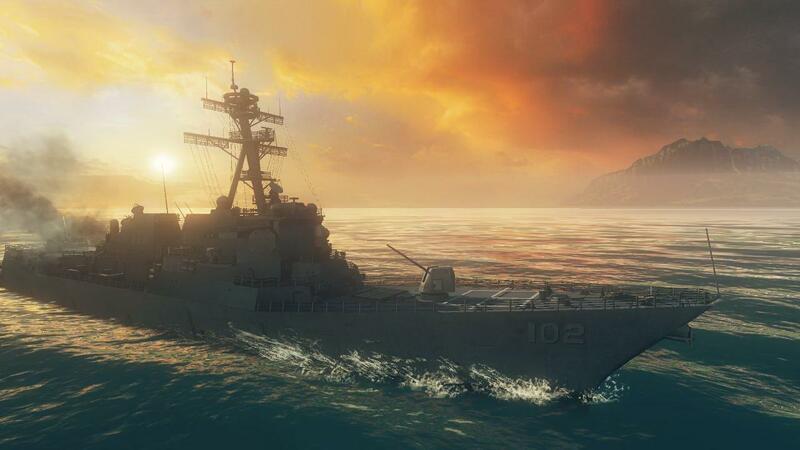 This isn’t WWII and the Battle of Midway, but a fresh experience with warships at your command. Using a device which can be accessed by pressing the LB button, you’re given a tactical overview of the surrounding ocean and islands, here Cole is able to command the ships to move to specific locations and open fire on any threats. What’s more, if ships are positioned close to land and on specific tiles, they can offer support to Cole during the first person shooting moments. The game is predominantly a first person shooter and aside from some stiff animations, screen tearing and stuttering video sequences, plays reasonably smooth. You point the gun at the aliens and after perhaps one too many bullets they drop. Probably the biggest issue with the shooting – which is quite solid – is the lack of imagination with the enemies. There are few varieties, and they look more like humans dressed in body armour. The AI tends to dodge incoming fire in the most irritating of ways, and something you’d expect from a game circa 1995. That said, if you can overlook the lack of finesse with the enemies and standard combat there’s some satisfaction to be gained here. What perhaps sets the game apart from other shooters is when commanding the ships to attack incoming water based alien craft. Other than positioning correctly and making sure all your ships under your command are doing their best, the first person shooting action ties directly to how well your offensive and defensive capabilities hold up. This is handled with the use of wildcards which are dropped from fallen enemies and can then be used on your ships to get the upper hand. It’s an interesting, albeit unrealistic element but surprisingly makes the combat a bit more gratifying. Wildcards come in various forms such as weapons upgrades, armour, repairs, attack modifiers and probably the best, ship control which allows you to shoot the weapons of a ship yourself for twenty seconds. On the default setting, ship control is likely to simply destroy any ship that comes under fire and is a good way of clearing enemy craft from the waters pretty quickly. Battleship boasts some reasonable looks, although as mentioned there are issues with framerate, screen tearing and stuttering videos, even when installed to the hard drive. That said, the game’s tropical looks are more akin to Far Cry and are quite well realized with palm trees swaying in the wind, cool waters and foliage to wade through. There are a number of invisible walls which do become annoying, but the reality is the game is fairly linear in its design to keep players focused on the task at hand. The audio is pretty standard fare though, and for the most part you’ll hear radio chatter more than anything else aside from the sounds of gunfire and explosions. There’s nothing truly stand out when it comes to the audio, and even the music sits in the background as your focus rests on the gameplay. Battleship isn’t the longest of games and therefore can be completed quite quickly. There are collectibles to hunt and the usual levels of difficulty and achievements to strive for, but aside from those, and if you’re not that bothered, you’ll see all that is offered in one session if you’re determined. In this regard, and with no added extras like a multiplayer you’ll be hard pushed to find much to do with this game once the story is over for the first time. Battleship has some neat ideas that are reasonably well presented, but a lack of extra modes and content make for a game that pales in comparison to other shooters available on consoles. If you’re a fan of the movie, even then there’s likely to be no real recognition other than a few of the alien technologies, the ships but none of the main cast – so that’s no Liam Neeson either then. Battleship is a short game which doesn’t command full price and if it does, cannot really be recommended as a purchase simply because it’s undoubtedly average and in many ways below average in terms of content. A specific battleship style horde mode would have worked great here or some other means of playing with the wildcards and ships, but alas, there’s little here to really get excited for. Overall, Battleship whilst offering some solid gameplay can only be recommended as a rental, as it’s devoid of features and will likely only last most competent players an afternoon at best.